Hello, everybody! Welcome to this week’s edition of 7-Imp’s 7 Kicks, our weekly tradition of listing Seven(ish) Exceptionally Fabulous, Beautiful, Interesting, Hilarious, or Otherwise Positive Noteworthy Things from the past week. We’re continuing our recent habit of featuring the work of a different illustrator each week as our post image, with two works from the delightful and talented Jamie Hogan. You may remember Jamie as the illustrator of Rickshaw Girl by Mitali Perkins, and the creator of the gorgeous portrait included in our interview with Mitali for the SBBT. She’s also not the person one should sit behind when one is attending a drawing lesson given by Ralph Masiello at the Charlesbridge Open House, even if she is very charming and kind in person. Thanks, Jamie, for the lovely summery images! 1* My mom fell and broke her wrist Friday night, which is definitely NOT a Kick. But she’s okay – she’s got this thingy on her arm (with PINS! UGH!) but she’s not in a lot of pain, and she should be fine in a few weeks. It could have been worse. That’s the Kick part, see? 2* Also, my brother is taking very good care of her. He stayed with her most of the night, but he finally had to leave the hospital at 4:00 a.m. because, as he put it, “the waiting room chairs have ARMS on them. What is up with that? ?” Good point. 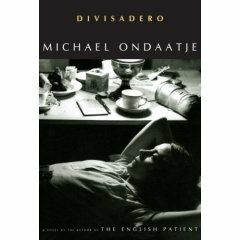 3* I finished Michael Ondaatje’s newest novel, Divisadero. It’s not my very very favorite of his, but it’s quite lovely. 4* I got to hang out with a friend and former co-worker who I hadn’t really seen since she got her new job. And we went to Finale, which is #497 in the ever-growing list of Things Cambridge Has That Ithaca Doesn’t And I’m Going To Miss A Lot. Son of a Witch that I got at that Gregory Maguire/Daniel Handler thingy a few weeks ago. 7* A lot of my favorite patrons have heard that I’m moving, and keep telling me how much they’ll miss me. Which is so totally rewarding, and utterly sweet of them. I’ll miss them too. Aw, man, am I glad Eisha’s mama is okay! Also, I’m not surprised that Eisha’s library patrons will miss her. She’s not a “shush!”ing librarian for sure. She’s actually friendly and kind and helpful and enjoys talking books, obviously, and would not ever give you a hard time if, say, you maxed out your library card and your daughter’s library card on two huge stacks of picture books (sorry, but I’ve had too many bad experiences with the unhappy, “shush!”y kind). #1). Those great images from Jamie Hogan! #2). I got to go with my three-year-old daughter today to the baby shower of a friend from high school who has had a long, hard road to this joyous pregnancy. I’m so excited for her! And at this shower, I saw another high school friend, and she makes me laugh really, really hard and is a fabulous human being. I’m pretty bummed that the pictures taken of the three of us today did not come out (time for a new digital camera); otherwise, I’d share. Oh, and pictured here is my gift to the baby-to-come, ’cause no baby needs to be without that book (and now this book, too). BEST OF ALL, no one gave Love Your Forever as a gift. Whew. #3). Cake at baby showers. And things like hand-made baby quilts and crocheted blankets that people like your aunts create for you. Awesome. #4). The fact that the other bloggers in the Summer Blog Blast Tour have ended up being not unlike a Blogger Support Group. Also awesome. #5). This post from Emily at …whimsy…. Go read it! Go read it! Great idea (thanks to Sara for pointing it out at a post over at Robin Brande’s blog). #6). Last week was the anniversary of the first date my husband and I had (hey, Jen Robinson has a similar anniversary around the same time, apparently!). On our first date nine years ago, we saw “The Planet of the Apes” (“Get your stinking hands off me, you damn dirty human!” — uh, that’s a line from the movie, not anything I said to him on our date) in a summer classic-movie series at the historic Tennessee Theatre, but this time we saw “Knocked Up.” Like Adrienne, I laughed so hard I thought I’d stop breathing or pass out or something. Very good movie. To boot, it seems like the soundtrack would be really great. #7 — last but far from least). This will be cryptic, but a very (amazingly) kind offer was made to me, and it’s all anonymous, so I don’t know whom to thank, and I absolutely could not in good conscience — and for several reasons — take the unknown donor up on the ever-so generous offer, but it was touching nonetheless. Confused? Sorry. That’s all I’m sayin’. But I had to mention it, ’cause such kindness is a definite kick. I had some chest pain this week, which was not anything serious (just annoying). But Eisha called me tonight to make sure I was okay, ’cause I hadn’t been online blogging or emailing all day. I was just busy all day, it turns out, but this tells me two things: 1) Eisha is a sweet friend, and 2) Damn, I must appear to be some kind of blogging addict! (But mostly it just tells me how thoughtful Eisha is) . . . These lists really do make you find The Good in your week, ’cause I thought my list would be short and under seven things. Heh. 2 – I saw the season 3 finale of “Doctor Who” (The Last of the Time Lords) as it aired last night; it was a bit of a disappointment, but at least I saw it as it aired! 4 – I’m in Gloucestershire for the weekend with my parents and brother – four days off work too – Woo Hoo! Hope it’s drier where you are than it is here in soggy England! Eisha, hope your mom is doing better and isn’t hanging out with friends the best. I don’t eny having to pack to move. Did that 2 years ago. Jules, I take it you are not a fan of Love you Forever? Um, not my fave either. Hope the rain stops, Michelle. 1. I actually, really left school for summer on Wednesday PM. 3. Am on CD # 5 of Harry Potter 4. 4. Author Party for Laini Taylor tomorrow at my house. 5. Leaving to see friends in Idaho on Tuesday. 6.I read Penny from Heaven by Jennifer Holm and cried. 7. I pulled weeds yeaterday ad deadheaded plants. Time in the garden, yes!! And one more, a love box of goodies came from Michigan as part of the blogger’s swap. Have agreat week. I will try to post next week late but am gone the next two Sunday AM. Have a great week. ”Get your stinking hands off me, you damn dirty human!” — uh, that’s a line from the movie, not anything I said to him on our date. 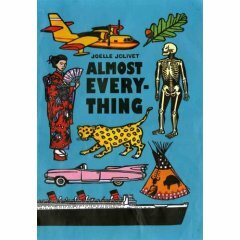 I love your first date story, too, jules! My hubbie and I saw many old movies at that theater. We were fans of the classic Humphrey Bogart/Lauren Bacall flicks. Eisha, how wonderful you can count on your brother, and that you have a sister to share books with! 1. My daughter’s boyfriend stayed with us all week, and he is polite and charming. And he cooks. 2. Robin’s party is real. 4. Having Éireann Lorsung comment on her poem yesterday. 6. Peaches now taste like peaches. Sara, I fixed your link for you. I got your back. (I got rid of those messages that you said you wanted deleted, the paging-tech-support messages — I hope that’s what you meant. I don’t mean to be all delete-y fingers). O MY HOW I LOVE PAUL SIMON and can’t wait to see that show. 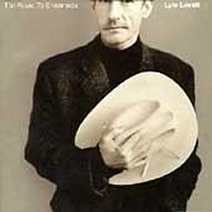 Eisha and I also both happen to love Lyle Lovett. We both love that inside image in the CD insert of “The Road to Ensenada” — what is it? It’s a picture of his hat, and the liner of the hat says “like hell it’s yours.” Did I get that right? I’ll have to go find that CD and double-check. And “Graceland” — ah, does it get any better? Thanks for telling us about that! And I’m going to go watch that video in a minute. Awesome on your daughter’s boyfriend. Five extra points for being a cook. Jone, happy summer!! Have a safe trip to Idaho, and come back and report. p.s. If either one of our girls had been a boy, we were likely going to name him Lyle! and p.s. again — Yes, how KICKIN’ was it to have that poet comment at our blog about her poem? So exciting. Wow, guys, Hogan’s illustrations are beautiful, the sort of thing I’d love to hang in my house. Jules, So glad you enjoyed Knocked Up! It’s so good to really, really laugh like that, isn’t it? It’s cleansing like a good cry, but so much better. 1. I finally got the new White Stripes album, and I’m totally loving it. 2. I also cannot stop listening to “Grace Kelly” by Mika. It makes me happy, I think, because I could also be purple. 3. Peter Rabbit visited my library this week, and the teen volunteer who wore the costume for three different hour-long programs made them the best costume character programs we’ve ever had. Staff, patrons, volunteers, me — everyone had a great time. That kid deserves a metal. 4. I finished Austenland by Shannon Hale, which was such a fun read. 5. This week, I climbed a ladder and WALKED on my roof to clean out the rest of the gutters. Talk about empowering (once I got over feeling like I was maybe going to throw up). 6. My second fifteen year high school reunion was totally fun. 7. I went to the drive-in to see 1408\ and Mr. Brooks, which are just exactly the kinds of movies one should watch at the drive-in. Even now, I have an unplanned day and a cup of coffee. That’s another Kick in itself, eh? Sara, Oh, yes, I am in for games at Robin’s party. Let it be a plan. I hope the week has been good for everyone. So far, it looks like we have some excellent lists. Here are my kicks for the week. 1. Started teaching 2 online classes this week. It’s craziness, but the teachers in them are awesome and we’re all learning together. On most days I feel like they’re teaching me. 2. Went to a very small pre-conference dinner with local school division heads and staff development folks. The food and company were good, as was the keynote speaker. 3. William and I stumbled on the Stink books by Megan Mcdonald and are having a terrific time reading through them. 4. Finally joined a writers group and had a fabulous first meeting with like-minded ladies. We talked about writing, our goals, how we want to function and did some free writing. Best of all, we all work at the same place, so we got to kvetch, which was a great opportunity for venting our frustrations. 5. Bought and finished Austenland on Thursday. Hey, I stayed up until 1 am, but hey, who needs sleep when a fine romantic novel is calling your name? 6. Also bought and finished Into the Wild this weekend. LOVED IT! 7. Was missing my Mom for some reason, so spent one wonderful hour on the phone with her this morning. And while I’m thinking about Adrienne’s post about her high school reunion, let me give my Mom some props for attending her 60th this weekend. Even at 78 she still likes to party. I suppose that’s another kick in itsefl. Eisha-Hope your mom’s wrist gets better soon. Jules and Jen-I can’t believe you remember the date of your first date with your husbands. Pretty impressive. 1. My parents are visiting. It makes me very happy. 2. Therefore, my house is the cleanest it has been in a very long time. 3. Therefore, Husband is happy. 4. Since my parents are here, my husband and I will be able to go out on a date. 5. The kids are totally in love with my parents and vice versa. 7. Warm Trader Joe’s Garlic Naan with a spread of Chevre Cheese, Olive Tapenade and crushed red pepper. Delicious. Freaky, Vivian. I bought Trader Joe’s Garlic Naan this week, too. And I hardly ever shop at Trader Joe’s. I went there for a Belgian chocolate fix, and the naan was an impulse buy. Jules, I think it’s cool that we celebrated first date anniversaries on the same week. We like to celebrate ours, especially this one b/c it’s been 20 years. Scary thought, but cool, too. But I don’t have a funny story like about the movie line. Eisha, I hope that you Mom heals quickly. 1. I started reading The Mysterious Benedict Society while killing time in the bookstore yesterday, and I’m completely hooked, and have to get the book. 2. Perfect California weather (wishing you better weather soon Michele) all week. Cool enough to sleep at night, and walk in the mornings, but warm and sunny during the days. 3. I bought my ticket for Robin’s Chicago party / kidlit conference, and made plans to spend a night with old friends from high school before the party. I hope that you all will come!! 4. I finished re-reading the third Harry Potter book. It’s interesting to go back, and see what’s different in the books from the movies, which I had seen more recently. 5. I got my to-be-reviewed books organized. It’s still a daunting number of books (not helped at all by my compulsive need to re-read all six of the Harry Potter books before book 7 comes out), but at least I have better organization. 6. One of my reviews was blurbed in the Kane/Miller Fall Catalog (thanks to Jules for pointing that out!). It was for Jez Alborough’s Fix-It Duck. And I’ve been loving the supportive SBBT team, too. 7. Yesterday afternoon we went to a tequila bar, where we sat outside on a comfortable couch, drinking simply amazing margaritas. It’s nice to get away, even if it’s only for a couple of hours. Hey, everyone, that video Sara linked to is great. Adrienne, I am so slow — I just figured out that there is even a new White Stripes album. I’m so behind. Can’t wait to hear it. I gave a pregnant friend yesterday a copy of my rockin’ children’s-music-that-will-not-make-the-parents-wanna-gag mix, and it includes “We’re Going to be Friends” by The White Stripes. Yay, Tricia’s mom!! Party down. Tricia, your writer’s group sounds great. Vivian, I was eating simple ‘ol cheese and crackers when I read that about the garlic nan, and I think I might have drooled . . . I hope you have a great time with your parents. Jen, I know how it feels to get review copies organized. I still need more space for them, but last week I actually — NERD ALERT! — made spreadsheets on my computer for my review copies, divided by publisher . . . and that’s ’cause I’ve gotten so many. It’s a good problem to have. Not a bad one at all. But my point is: I know how it feels to get that organized with them. Jen, where did you all go on your first date, if I may boldly ask? Baseball game?! Jules, when I said that I got my review books organized, I actually meant that I cleaned up the spreadsheet that I use to keep track of them, so that I know when each one was requested, received, and reviewed, and if I notified anyone about the review. Now it’s sorted so that I can see the ones that I haven’t reviewed, by date received. There are a couple that I feel very badly about, and hope to get to soon. Not that I’m 100% first in first out, but it’s at least a guideline for things that slipped through the cracks. Guess I’m a nerd, too. The first date… no I don’t think I want to go into details about that right now. A baseball game, though. That would have been cool! Jules, I keep telling the children’s librarian I work with who also plays the guitar to learn “We’re Going to Be Friends” for storytimes, but he stubbornly refuses to learn anything that isn’t an action song. He gets all, “Why would the kids want to just sit there and here me play that?” And I get all, “Because the song is freaking cool.” Stubborn, stubborn. One of these days I have to learn to play guitar so I can just do it myself. Anyway, you should definitely listen to the new album. Good stuff. Incidentally, I have The Innocence Mission CD en route from amazon. Good stuff — thanks for turning me onto it. Jules and Jen, you intimidate me. I just have three piles on the floor of my office: haven’t read-read-library-books, haven’t-read-review-copies, and have-read-but-haven’t-reviewed. And Jules, in my defence, I’m not always prone to panic if I don’t get an email from you in a day – but I think my mom’s accident had put me in hypervigilant mode. Michele – I admire your discipline. There isn’t much that could pull me out of bed at 5 a.m. besides a fire. Jone – happy relaxing, and have fun in Idaho. Sara – thanks for the heads-up! Paul Simon is one of my all-time fave singer-songwriters, and the thought of Lyle Lovett covering 50 Ways is giving me goosebumps. And yeah, I should have mentioned Eireann Lorsung commenting on the blog as a kick. That was totally awesome. Adrienne – I did know there’s a new White Stripes album out, but I’ve only heard the one song “Icky Thump” and it is fierce. I must get my hands on the CD soon. Tricia – yay for Stink! And for Judy Moody! Those are really fun books. Vivian, your lists always make me so HUNGRY. I may have to run out to Trader Joe’s right now. 1. Reading all of these tasty, joyous, serendipitous, celebratory KICKS. 2. My daughters’ swim meet when they both swam back stroke (even though they don’t love it) because they were asked to. 4. I will be IN THE MOUNTAINS in less than a week. Home of my heart. 5. Date night last night with my husband and another couple who showed us their amazing photos from Turkey and Greece. 7. My husband’s new job — making him very happy, which is making me very happy. 1. Cherries at $1.69 a pound. 2. Long afternoons at the pool. And with two seasoned swimmers, I can just sit back and read. 3. Some great books this week, like First Light and Story of a Girl. 4. Progress on one summer goal by joining Jacketflap. 5. Two pairs of my favorite baggy shorts for $3.99 at Rugged Warehouse. 6. Writing my Knuffle Bunny Too post and getting lots of comments on it. Liz – ah, mountains. I love the mountains too. Have fun. MotherReader – I also love cherries. Especially cheap ones. Actually, cheap is my favorite cuisine in general. Baby, it’s “Take your stinking paws off me, you damn dirty ape.” Get the popcorn ready, you’re sentenced to a remedial viewing of all five(*) movies. Re. the rain – apparently we’re due to have our summer on July 15th – St Swithin’s Day !!! (If you’re wondering “So what?” – there’s a tradition that whatever the weather does on St Swithin’s Day, it will then do for the next 40 days… You can bet lots of Brits will praying/hoping that it is a nice day on July 15th ! Eisha, my friend calls it “Sparrow fart” when talking of early morning… Makes me snigger !! Hey, Michele, St. Swithin’s Day factors into the recent (and wonderful) YA novel Billie Standish Was Here. That’s where I first read about it. (Just sharing) . . .
Here’s to a nice day on July 15 . . .
Blaine, you’re such a romantic. I missed you yesterday — sorry! Happy week all — enjoy the 4th! Yay, Nancy! Thanks. There is no rule that says you *have* to post on Sundays. Thanks for doing that. I’m painfully embarrassed that I got that “Planet of the Apes” quote wrong, ’cause that would be the Marky-Mark movie I quoted. Ew. Just . . . ew. Blaine, I caught that, too, but I wasn’t going to say anything because it was Jules’ story and I was trying to be NICE. But you threw in that “baby” at the beginning, and that was awfully sweet, so you’re forgiven. But yeah, Jules, he’s right. Yeah, this is why I’m mortified. 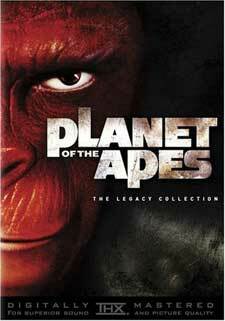 The Planet of the Apes series I love, the only sci-fi series of movies I can handle. And I somehow subconsciously quoted the MARKY-FREAKIN’-MARK VERSION? WHA??? (having to watch them again with my wonderful husband and a bunch of popcorn is not punishment, by the way) . . .
Jules, here’s hoping July 15th is splendid !